I find good news exceedingly rare. We are always talking about the latest scary thing. As someone who has advocated for healthy eating since 2009, I do need to point out some good news. The largest change in the American diet is not an increase in the consumption of Twinkies or an extra pound of bacon per year. No! It is a SIGNIFICANT drop in soda consumption. That is right people! Americans drank 10 gallons less a year of soda (including diet) last year than they did in the late 90s. What are they drinking instead of soda? More good news! Americans are drinking bottled water at the rate of 35 gallons per year and this consumption has seemed to replace soda (up form 15 gallons per year in the late 90s). The changes can’t come too soon as the obesity epidemic (which means a disease which rages without end) continues to plague our nation. People are equating diabetes and obesity to sugary soda consumption and cutting back. I’m not sure why they are choosing to buy bottled water (maybe all those drought ridden Californians who don’t have any water?) because you can usually find a water fountain or bring your own bottle – but I don’t care! I am thrilled that BIG SODA (you know who that is) is losing money no matter how many billboards they paper or “feel good” advertisements they air at the Super Bowl. People are getting the message. Have you noticed a decrease in soda consumption? What do people serve at parties – has it changed? I see more people drinking water than soda. Now if I have any kind of gathering I buy less soda than I used to and there is always so much left over. I also have noticed that my teenage kids' friends drink water more than soda. Sorry, to be a downer but I think a lot of people have also switched to 'energy' drinks which are also just laden with artificial sweeteners and colors. I could not start a day without Diet Coke for decades: I was addicted. I ordered food deliveries just to get the Diet Coke. Drank Diet Coke all day, all night. Haven't had a Diet Coke in four years: not bloated, lost weight, have energy, not on edge. I missed the fizziness, though. So, I drink Zipfizz first thing in the morning. Fizzy, but healthy. It got me off Diet Coke, thank God. The rest of the day is water, water, water. PS I fill empty Zipfizz tubes with reminders: wristbands, stickers, rubber bands. Put "CHILD IN CAR!!!!" labels on them, give them away to help prevent hot car deaths of kids and pets. Need lots of empty Zipfizz tubes, PO Box 851943, Richardson TX 75085 ;-) Thanks. As a dietitian and diabetes educator I am certainly glad to see more people drinking water. However, I worry about all that plastic going into landfills. I encourage patients to use refillable bottles. We rarely buy soda anymore.. I think the last time was when I needed a bottle of Coke because my mother's rib recipe called for it. We have a Sodastream that we use for making fruit spritzers, we don't even have the soda flavoring they sell. It works great because the bottles are reusable. For parties & gatherings I'll usually make up a large batch of sparkling lemonade, and have a pitcher of water also. I see more people drinking water but we must not forget that more people are drinking more coffee usually with cream and sugar. Also, the fancy coffee drinks like lattes, ice coffee, etc. Then don't forget the influx of energy drinks that are horrible for you! Worse then soda since young people have died from cardiac arrest caused by the amount of caffeine consumed. We still have a long ways to go. What is ZipFizz??? I have never heard of that. I wish California could have some of our rain! OK back on track. I myself have been drinking more water. I mostly do a pitcher and refillable bottle but I have to add lemon and Stevia and it has to be super cold. Otherwise it is so bland. I think a filter may help with the taste,not to mention it may also be healthier. In response to 'What is Zipfizz????" in a previous question. lol.....it has been such a daily part of my life for so long that I forget not everyone is familiar with it. It is a drink mix that has vitamins and caffeine, so gives energy and healthy stuff and is kind of fizzy, so replaces that desire for the carbonation in soft drink. I drink it instead of coffee. Tea, tea, and more tea! We are from Texas and we are all about the tea. We keep sodas in the fridge in the garage and they go virtually untouched at any gathering. Out of sight, out of mind! Yes, we drink both sweet and unsweet tea, but over the years we have drastically reduced the amount of sugar and I always have a Gallon of unsweet tea alongside the sweet and they both are drank at about the same rate. How do you make a good and tasty unsweetened iced tea? I'm in Arizona where last week it was 108 ( this week the 90;s) and we drink water and iced tea. I love sweet tea but if I put an orange slice in the tea or water its awesome and no sugar needed. You rarely see people here without water. We just have to have it here. I myself do drink less soda that I used to in the 90s and early 2000s. There was a time when I would drink between 2-4 L of diet cola PER DAY. The day I got a nose bleed for no reason caused be to re-evaluate what might have caused it and caffeine seemed to fit the bill. Out went all pop. Now, it takes me 2-3 days just to finish a 710ml bottle. Going cold turkey on pop was hard from the withdrawal standpoint, but otherwise, I didn't really miss it. I was actually amazed at how many bottled water companies add salt to their bottled water. Check out the label the next time you buy a bottle. 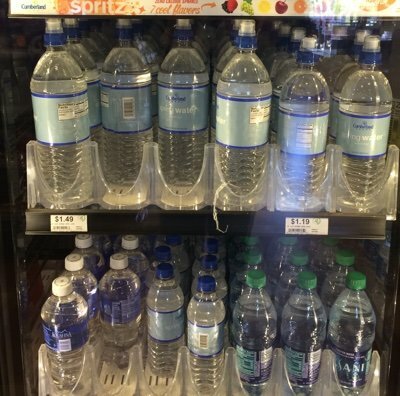 I don't care for the plastic bottles in our landfills either but I buy bottled water when I run out to pick up lunch and want something to drink or when drink options are in a vending machine or cold case and there's water. At home I use a pitcher but I prefer cold water when I'm away from home and tepid tap water doesn't do the trick. I'm also not fond of carrying around my reusable water bottle every time I leave the house. So anyway, along with the fact that I ditched my diet coke habit, that's why I buy bottled water. Lisa where are you?? Last email I received was oct8th. Did you drop me from your email list??? I drink about 2 cups of coffee a day, and after that from a pot of freshly brewed tea every day. Soda companies won't go broke - they manufacture the bottled tea and water. The water in too many fountains taste lousy so people don't like drinking from them. Either a metallic taste or chlorine puts people off from the foutains. Would you please tell me what kind of tea you use and exactly how you brew it? 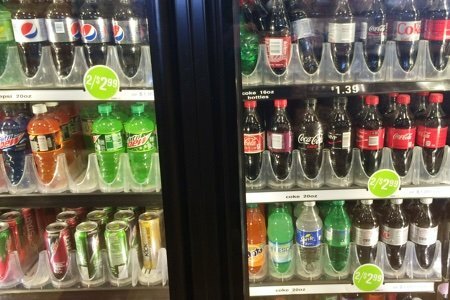 The dining services at the college where I worked said the consumption of soda is way down. However, as others have pointed out, they are drinking tons of odwalla drinks and energy drinks (at$3-5 a go). However we do have water bottle refill stations being added all around campus.